Glenn Kearney, Maria Forsberg and Jason Thomas represent Motorcycle-Superstore.com at Round One of the 2012 season of the Can-Am Grand National Cross Country (GNCC) at the Moose Racing Westgate River Ranch GNCC in Florida. 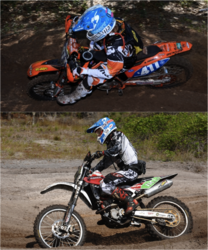 Maria Forsberg (top) and Glenn Kearney (bottom) Started 2012 GNCC Strong! Motorcycle-Superstore.com is proud to be represented by such solid, professional riders. We’ll be cheering them on throughout the series. Round One of the 2012 season of the Can-Am GNCC was hard-fought over miles of very demanding terrain. The Moose Racing Westgate River Ranch GNCC in Florida proved challenging for all involved, and definitely took its toll on riders in every class. The Motorcycle-Superstore.com sponsored GNCC riders, Glenn Kearney, Maria Forsberg and Jason Thomas started the season strong with impressive rides and commendable finishes in this round one cross country race. Maria Forsberg out of Seattle, WA took first place in the women’s pro class with a very solid, consistent ride on her Red Bull Factory KTM, finishing 6th overall. Glenn Kearney finished on the podium in third place in the XC2 Pro Lites class, with his teammate on the Fred Andrews Husqvarna GNCC team, Jason Thomas, close behind. Thomas finished fourth in the XC2 Pro Lites class. Round two of the Can-Am Grand National Cross Country Series will be heading to Washington, GA for the Maxxis General GNCC on March 17th-18th. For more information about the Can-Am GNCC and round two in Washington, GA, visit http://www.gnccracing.com.